NGC1360 (PN G220.3-53.9) is a beautiful, elongated planetary nebula in the southern constellation of Fornax, The Furnace, approximately 1,150 light years distant. It was discovered by Friedrich August Theodor Winnecke in 1868. The main shell is about 8′ x 6′, but it also has bipolar northern and southern knotted jets that extend the length to about 13′. 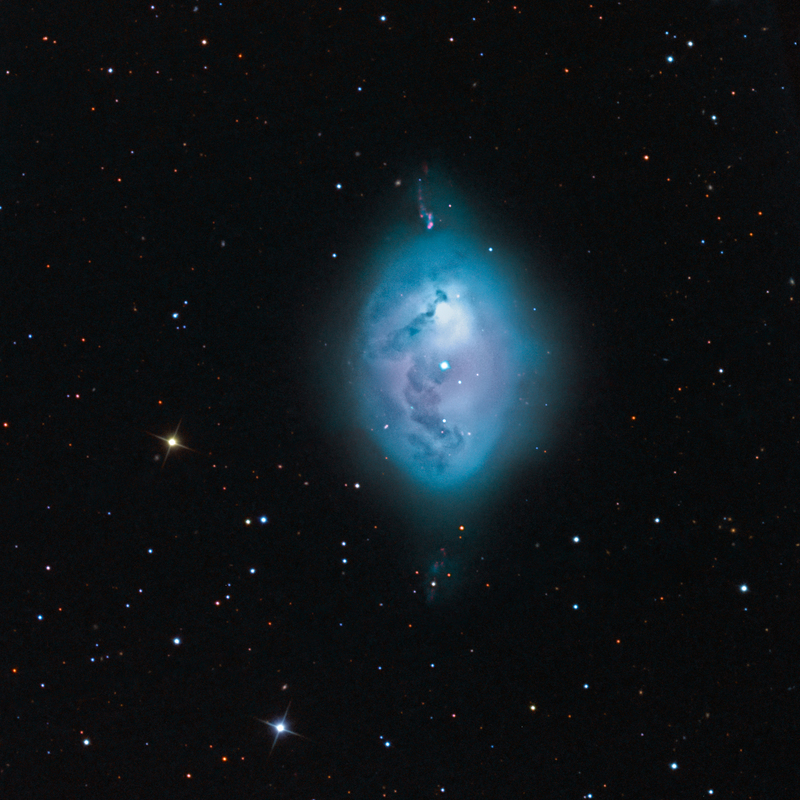 NGC1360 shows strong OIII emission with weaker H-a emission resulting in the characteristic blue-green color. NGC1360 is often described as featureless with some darker regions. These darker regions are more well-defined in the above image, as if they were dust lanes partially obscuring the bright core of a galaxy. The northern "jet" seen in other images is also well-defined, but the narrowband filters were able to also bring out the southern jet. Researchers have found an intense stellar magnetic field but an absence of a significant stellar wind or evidence of a binary pair of stars suggesting that jets are due to a magnetic collimation that is inclined 30 degrees to our line of sight (Garcia-Diaz, et al. Astrophys. J., 676, 2008, p 402).